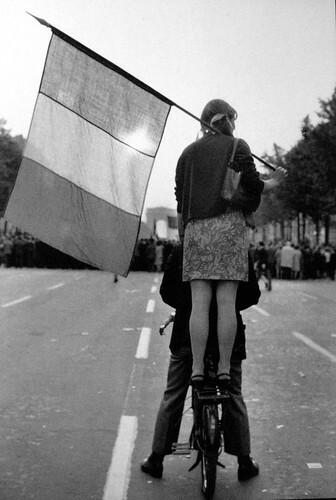 Classic photograph from the hand of Henri Cartier-Bresson, taking in Paris, May 1968, during the society-changing demonstrations iniated by the students. I'am pretty sure that it is a Velo-Solex, not a real bike. Yes, looks like a Solex. Robert Bresson was a film maker. This shot is probably from Henri Cartier-Bresson. you're right. my mistake. fixed. thanks. Sure isn't Any City, USA in 2010. If only . . . . I could look at his photographs for hours.